I've explained what I love about Community throughout the course of these blog-reviews. The praises range from things such as continuity and character development to humor and wit. One of my most frequented compliments, however, revolves around the show's ability to take an episode that is seemingly focused on one character and instead use it to highlight another character's development. "Introduction to Statistics" is for me, one of the more underrated Britta episodes in the first season, and perhaps the entire series. Explicitly, the episode doesn't seem to be about her, but in fact reveals a lot more about her character than other episodes. I explained last week exactly why Britta stands out for me as a character - "Football, Feminism and You" displayed Britta's weaknesses and vulnerabilities as a character. This episode, though, really solidified her compassion for Annie, which is something wonderful to see early on (considering how their relationship gets rockier post- season finale). It's endearing, and I choose to believe that Britta only truly detested Professor Slimcalves... I mean, Slater, after the statistics teacher acted pretentious. I do think her intentions were focused solely on Annie and making sure that she looked out for the younger woman's well-being throughout the episode. Let's remember that this was - for a shorter period of time - Britta's study group. In fact, you can make the argument that at this point in the season, it still is her group. She used to be in charge as the leader and feels the need to still "protect" the good people in the study group from Jeff. Britta truly is a compassionate and good person at her core. She often has decent intentions that unfortunately (but comedically) go awry, thus making her look either incompetent or rather like a buzzkill. She wants to be needed, as I explained before, and this is one of the things we often forget about her character. We assume that because she's a little rough around the edges that she doesn't care as much as stereotypically "softer" female characters (i.e. Shirley, Annie) do. And thus, this is an episode that is just as much of a Shirley/Britta story as it is a Jeff/Slimcalves one. If you are potentially in need of a refresher, let's recap what this episode was about. It's Halloween at Greendale, where we learn that Annie has opted to do an extra credit assignment (throwing a Spanish-themed Halloween party), and is attempting to invite everyone. It appears that the vast majority have RSVP'd with the exception of Pierce (who can't figure out how to work his phone) and Jeff "too-cool-to-be-at-Greendale" Winger (who declines the invitation). And see, Jeff is a fun character to dissect in this episode too. Britta genuinely cares about Annie and wants Jeff to show up at the party for her sake. Of course, the former lawyer has yet to learn his fair share of lessons in the value of friendship, so he declines the invitation. And Jeff intrigues me in this episode because we see a bit of continuity between the previous episode and this one in the fact that he's become guilted into "feelings" more than he realizes. And it's this unconscious change in character - a lot of us call it "growth" - that the audience doesn't fully realize until we watch season 3 and compare that Jeff Winger to this one. One thing should be noted: characters don't usually fundamentally change who they are though. Jeff will always be a selfish character in some way, shape, or form. But his perception of himself and of the people around him shifts ever-so-slightly in this episode. We'll get there momentarily, but reflect on who Jeff truly cared about in the pilot (hint: the answer is "himself only") and compare that to the end of this episode. We learn that Jeff finds his new Statistics teacher attractive and plans to ask her out (it's kind of courteous that he runs it by Britta first, to let her refuse - which she doesn't). All right - let me ask you all this: what makes a good villain? (And I'm not calling Slimcalves a villain... necessarily, but I'll let you make your own judgments regarding her.) I had a conversation at work the other day with my co-workers that involved Harry Potter. And we agreed that, while a lot of people detest Snape and cast him as the villain, we don't. Instead, we cringe whenever we read about Umbridge or see her on screen. And that's what made J.K. Rowling such a brilliant writer - when you have the ability to make an audience cringe or ball their fists or grit their teeth every time a character comes onto screen or the page of a book, you know you have really embodied the adage "show, don't tell." You've gone from merely writing a story to creating a character. This is all to say that I didn't like Slater when she appeared on my screen. To this day, I cannot stand her character. She falls only slightly behind the annoying teenagers in "The Art of Discourse." Why is this? Well, before I tackle that question, I must first wonder if the initial intention of the writers was to make the character unlikeable. If it were so - because later she obviously returns to combat Britta - perhaps it was to make Britta more likeable in the audience's eyes. It would have been a subtle way to encourage those who may not have liked the blonde over to the "good side." Because when your options are Slater or Britta only, most people are probably bound to choose Britta. Unless you love Slater for some reason (but I've met few - Jeff/Britta or Jeff/Annie shippers and non-shippers alike - who feel this way), in which case... well, you may want to skip this review. So initially, Slater isn't entirely villainous - she's snappy and witty, actually. However, she has an air of haughtiness around her (and that's probably why I didn't care for her character initially, thus solidifying my dislike later on). This is really all lead-in to say that Jeff's attempts to ask out Professor Slimcalves fail when she informs him that she doesn't date students. 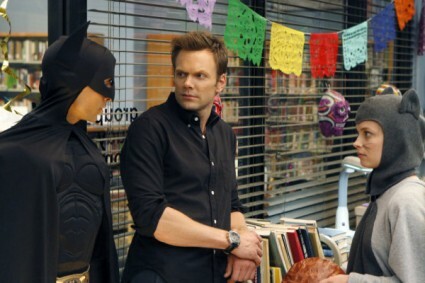 And Britta looks completely bemused by the sight of Jeff literally chasing his professor out of the classroom. And - again - I genuinely think that at this point she didn't care who Jeff dated. Let's move onto Shirley, then. We get a very nice Shirley storyline in this episode, especially piggybacking from "Football, Feminism and You" where Shirley explains vulnerability to Britta. Here, we have an episode that utilizes Britta (who is completely unconcerned with the idea of Jeff and Slater) to achieve character development for Shirley (who, despite her explanation of being excited to be free of her wedding ring at the beginning of the episode, is really bitter and justifiably distraught over the direction her life has headed - which will come back around in "Comparative Religion"). And again, this is what I love most about the show - utilizing a story that is seemingly about one character to really highlight another. Jeff, having just been rejected by Slater, turns around in the hallway and apparently Annie - in addition to appearing out of bushes - randomly appears out of thin air and attempts to convince Jeff to come to her party (successfully, actually). This may be one of my top Alison Brie moments because she is hilarious in it. (Also, sidenote: is anyone else rather curious as to how often Annie attempted to use tears in order to get something she wanted? Just a thought). I love also that Jeff appears initially taken aback at Annie's attempts at being "formidable." It's the exact opposite of her "blowing everything off" speech next season, but Jeff seems amused in both cases. Eventually, he cracks which is something pretty nice to see in Jeff - the fact that he gives into the group, begrudgingly at first. Of course, you could make the case that he ONLY did this because Slimcalves blew him off. Nevertheless, I claim progress. The entire group shows up to Annie's party, and it becomes apparent that Jeff only appears at the party because Slater blew him off. In fact, this becomes even more apparent when Chang informs him that Slater is at the faculty party. Seizing an opportunity to hit on the professor, he ditches Annie's party. And what I find quite hilarious to note is that Jeff's fallback these first few episodes is to bribe people with money. You know, maybe THAT is why he can't afford rent in the next episode! I bet if I tallied up how much he paid off everyone since the pilot to do things for him, I'd have a nice (large) number. Once Britta realizes that Jeff ditched Annie and her party, she goes into "protect the group" mode (by lying to Annie and roping Shirley into helping confront Jeff too). This instinct to protect the study group is something that we will eventually come to associate with Jeff, but for now, it's Britta's turn to help. And at this point, Shirley is still using an form of potential insult in order to justify her own anger. And that's how I feel Shirley's character should behave, right? She would never be purposefully hateful to someone. But the moment she is able to justify an emotion (such as using Britta to take out her own anger on Slater), she does so. I think it might numb the guilt for her a bit. Jeff shows up at the faculty party, insisting that he "hates everyone here [but Slater]," which is of course a lie that we will come to realize later in the episode. We know for now though that Jeff will say and do just about anything to get what he wants. And then the study group barges into the party and requests Jeff's help in dealing with Annie's insecurity and Pierce's weird trip. And this is where Britta and Slater meet one another, officially. See, up until the moment that Slater opened her mouth, I thought: "Wow, Slater and Britta teaming up to tease Jeff about his cowboy outfit would be hilarious." And I'm not sure if it was intentional for Slater to come across as mean as she did when talking to Britta. Re-watching I almost feel like she assumed Britta was on par with her intellectually because of her wit, but then perhaps realized she wasn't? I can't figure out if that's what was meant to happen. Regardless, Slater opens her mouth and then becomes pretentious. And then I disliked her even more. And here's the thing about season 1 Jeff: he doesn't just do anything possible to avoid being convicted by the group, or helping them - he's downright mean about it. In the pilot, as I mentioned a few weeks ago, he calls Abed out on his disorder in front of everyone. In this episode, he yells at Pierce, Britta, and Abed. He's literally a jerk at this point when it comes to getting what he wants. Everyone leaves the cafeteria and Britta finds Shirley in Slater's office. And I tweeted the lovely Yvette Nicole Brown about this last night, but this is one fantastic scene. If you haven't realized yet, I am a huge fan of Shirley/Britta scenes. And - correct me if I'm wrong (always feel free) - I think that this is the first sincere heart-to-heart (regarding personal life) that we get between the pair. It's touching and perfect, because Britta doesn't know what to really say, so she does the best she can. I think this particular moment perfectly embodies the heart of the show at such an early stage in the series and it was probably my favorite scene during the re-watch. Slater finally agrees to Jeff's advances and as they walk to his car, the study group (and all other party-goers) are gathered outside of the library and beg for Jeff to help them with Pierce (who has blockaded himself within a fort of tables and chairs). What's fantastic about this episode is that Jeff returns to the party for the person he cares for the least in the study group. It wouldn't be a huge leap in character growth for him to return for Britta or Abed. But the fact that he comes back to help the one person he loathes in the group says a lot. Clearly, his statement to Slater earlier is null and void - he DOES care about people at the school. He doesn't fully realize it yet, or exactly what that means. Also, he turns Slater down in order to accomplish this. Remember the pilot? When he basically turned human beings on one another in order to get a shot at Britta? Yes - character growth. The episode ends with Abed-as-Batman narrating, and I love that Jeff humors him and refers to Abed as "Batman" rather than his actual name. I also find it interesting that the dance is the moment the writers thought about how Annie was really excited to be dancing with Jeff, and that this kind of is the subtle kick-start to everything else. And I love that we end exactly how we do every Halloween episode - with the study group together. - The voice command gag with Pierce never gets old. Or less funny. - "The last time you did this, I saved a vial of your tears and have slowly been building up an immunity." - "I was so unpopular in high school, the crossing guard used to lure me into traffic!" - "YOU DON'T HAVE TO KEEP DOING THAT." - Who noticed the oddly-looks-like-Christmas-Wizard-Duncan guy? - Gillian's delivery of her lines in the cafeteria were brilliant. - My favorite outtakes include Donald's ad-libs in this episode. - "Well, when we go to floating skeletons with our problems, we get what we pay for, don't we?" - "I'm Batman." "You sound like Cookie Monster." Danny Pudi's Christian Bale impression is always, always golden. Another great review! This episode always makes me laugh so hard! I just listened to the audio commentary for this episode. Dan Harmon said that this was sort of the beginning of both Jeff loving the group AND the Jeff/Annie chemistry, so you were spot-on! It sounded like the writers were surprised by both things, but it's just a testament to this amazing cast's amazing chemistry. I love them so much, it makes my heart hurt to think that we might not get a 4th season!